It's no surprise that shoulder injuries are very common in golf, especially with the amount of motion that occurs at the shoulder during the golf swing. Injuries to the muscles and tendons that help stabilize this joint are very common. The majority of these shoulder injuries are related to overuse. It is also possible that more traumatic injuries can occur to the shoulder whether its from faulty mechanics, poor posture, muscle imbalance, or even too much ground contact (divot!). First, a quick anatomy lesson. We will start with the bones. The main component of the shoulder is the glenohumeral joint. Your upper arm bone, the humerus, connects with part of the shoulder blade (scapula), to form this joint. This is where the majority of your shoulder motion comes from. This joint is held together by the joint capsule, ligaments, as well as muscles. Glenohumeral joint motion also is accompanied by rotation of your collarbone (clavicle) and well as rotation of the shoulder blade itself. Rotation and stabilization of the shoulder blade is why mid back strengthening is so important. The main muscular restraint for the glenohumeral joint is the rotator cuff. The rotator cuff is comprised of four muscles: infraspinatus, supraspinatus, subscapularis, and teres minor. These muscles mostly cause rotation at the shoulder, which why they can get so overworked by the golf swing. Another tissue that can be irritated is called a bursa. A bursa is a fluid filled sac that reduces friction between muscles/tendons and bone. You have bursa all over your body, but one around your shoulder commonly gets injured. Inflammation of a bursa is called bursitis, just like inflammation of a tendon is called tendonitis. There are many different ways to injure your shoulder, but the shoulder injuries listed below (in no particular order), are ones that are commonly found in golfers. 1. Sprain/Strains - Basically over stretching of ligaments and muscles. Commonly affects younger golfers because their muscles aren't as strong. Best way to treat these types of shoulder injuries would be to rest and perform some gentle range of motion or stretching exercises. The last thing you want to do is completely immobilize this type of injury because it has the potential to develop into something more severe like frozen shoulder. Once the majority of the pain is gone with your range of motion, you can begin light shoulder strengthening. This will include exercises for the rotator cuff and addition to stabilizer muscles around your mid back. Progress these exercises until you feel close to 100%, and then begin a gradual return to golf. 2. Tendonitis/Bursitis - Inflammation of tendons or bursa. Can become chronic if not properly treated. Could be due to overuse, weakness, muscle imbalance, poor posture, and/or mechanical issues with your golf swing. Performing a well rounded golf weight training program will help prevent these types of injuries. To treat, start with rest and possibly ice. Also, add a few basic shoulder stretches and range of motion exercises to keep things moving. Once motion has been restored, begin light strengthening, with an eventual return to golf. Overall, this could take a few weeks up to a few months to fully resolve. Physical therapy and/or injections from your physician may be indicated in more severe cases. 3. Rotator Cuff Tear - One of the more severe shoulder injuries that a golf can experience. More likely to occur in a older golfer and could be the result of excessive force being placed through the shoulder from mechanical issues, posture, or even something such as a large divot. The most commonly torn muscle is the supraspinatus, but a tear can also occur in any of the other 3 muscles. There are many different varieties of tears, which I will not go into here, but tears can be either partial or full thickness. You may be able to still play with a partial tear, but it is highly unlikely (but not impossible) with a full tear. I've seen people who cannot even lift their arms from their sides with a full thickness tear, and I have seen people who can lift 10 over their head without any difficulty. Each tear will present differently depending on the person and the strength of the surrounding tissue. Physical therapy may help strengthen the supporting muscles, but often surgery is indicated, particularly with a full thickness tear. 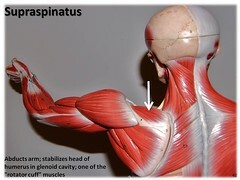 To learn more specifically about the Supraspinatus muscle, since it is by far the most commonly injured, please follow the link. 4. Bone Spurs - I hesitate to call this a "golf injury" simply because it is typically not an injury at all. It is usually a degenerative change, more commonly found in older golfers. These spurs typically occur underneath the AC joint. The AC joint is where your collarbone attaches to your shoulder blade, directly above your actual shoulder joint. This can be very painful, especially if the spur rubs against the bursa or supraspinatus muscle. Compression of either the bursa or muscle is referred to as shoulder impingement. Chronic impingement and friction at this area could lead to inflammation of those tissues, and in the worse case scenario, a rotator cuff tear. Postual education is key in helping "open" up the space underneath the AC joint. This will allow a greater freedom of movement for the bursa and rotator cuff tendon. The the spur is large enough, it could be surgically removed in a procedure call a subacromial decompression.